Born Christian August Alexander SCHIDLOWKSY. Surname also spelt SIDLAUSKI, SIDLANSKY. Known as Alex. Height 5 feet 9 inches. Weight 13 stone 2 lbs. Chest measurement 40-44 inches. Complexion fair. Eyes blue. Hair grey. Sight, hearing & colour vision all normal. Limbs well formed. Full & perfect movement of all joints. Chest well formed. Heart &lungs normal. Teeth good. Free from hernia, varicocele, varicose veins, haemorrhoids, inveterate or contagious skin disease. Vaccinated. Good bodily & mental health. No slight defects. No longer physically fit for war service (overage & bronchitis). 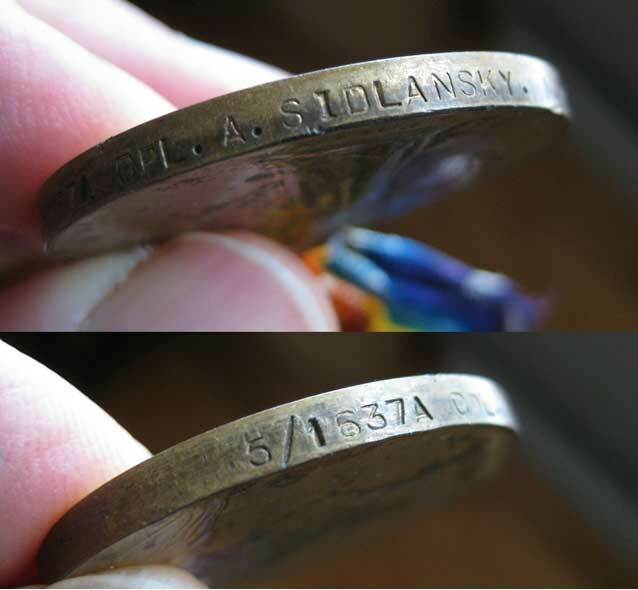 Christian August Alexander Sidlausky, known as Alex, recorded when he enlisted that he was born on 16 July 1875 , in Libau, Latvia, then part of Russia. A seaman, he had come to New Zealand by early 1897. Family records are sketchy, but their genealogical research in Latvian State Archives (Riga) uncovered that he was in fact was born on 16 July 1870 in Libau (now Liepaja, Latvia). He was baptized at home on 13 August the same year and was confirmed in the Lutheran church on 9 November 1885. He was the son of Captain Michael Sidlausky (Schidlowsky) and his wife Anna Katharina, née Schnicker. Here Alex plied the waters between Wellington or Dunedin and Sydney, New South Wales, Australia, working on the Wakatipu, Tarawera, Waikare, Mokoia, Rakanoa, and maybe other vessels, from 1897 to 1907. Alex became a naturalised New Zealander on 21 August 1899 while residing in Dunedin. When war broke out he was living in Timaru and working as a dredge hand for the Timaru Harbour Board. Having enlisted on 29 December 1914, he embarked on 14 February 1915. 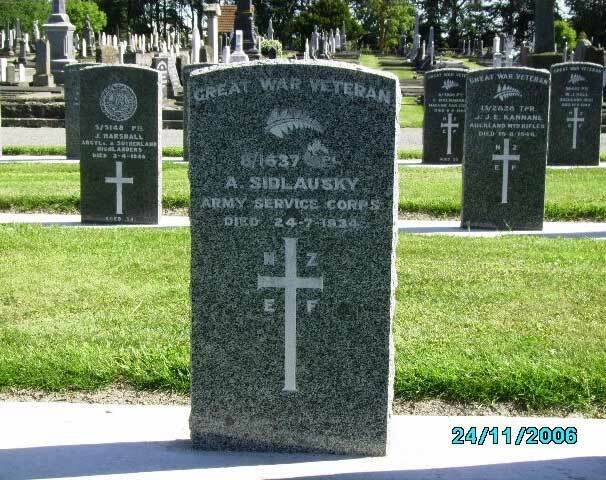 After the war Alex returned to Timaru where he died on 24 July 1934 at the Public Hospital. On enlisting he had stated that he had made a will and left it in the custody of Father Murphy, Roman Catholic Priest at Timaru. No will, however, was located and the Public Trustee administered his estate. It was noted that Alex had corresponded with Miss Esther Kelly of Latter Street, Timaru, during the war. Esther Jane Kelly married in 1919 and remained in Timaru. Maybe she was able to help in finding family, there being none named on enlistment. Two years after Alex's death, the Public Trustee located next-of-kin - a brother, Mr Edward Sidlauskis (or Schidlowsky), living in Latvia, and a sister, Mrs Alma Katharina Mersliakoff, living in Liski, Soviet Russia. It was resolved to forward Alex's war medals to his brother. At his death he had, in New Zealand, £187.17.11 consisting of cash and contributions to the National Provident Fund. Curiously, family research has discovered that Latvian Archive records show Alex and his wife Alexandra Levenberg, had both been issued Latvian passports in Libau in 1929. It seems Alex had returned and had been living in Latvia in 1927, wher he married Alexandra Levenberg(born 14 July 1881 in Mitau - now Jelgava, Latvia). Why he returned to Latvia is a matter of conjecture, but perhaps Alex had returned to Latvia because, after two years of struggle in the Latvian War of Independence, Latvia finally won sovereign independence, as recognized by Soviet Russia in 1920 and by the international community in 1921. 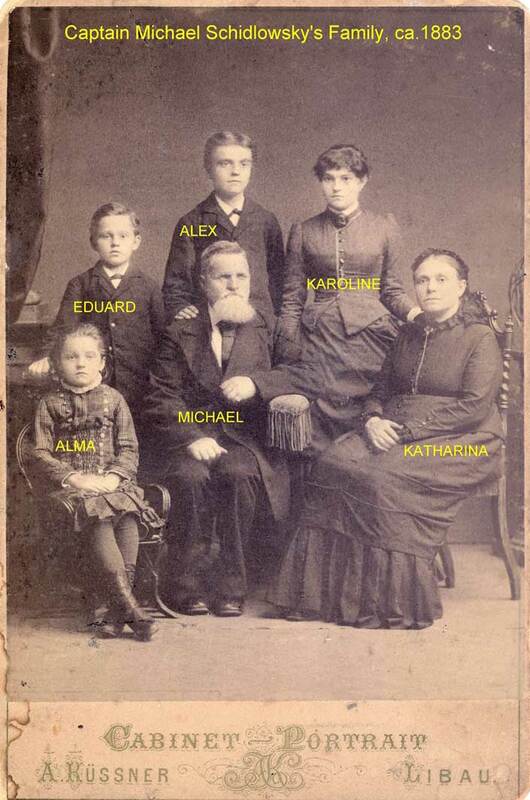 There are no recorded children of the marriage and again it is possible that "Levenberg" could be a Jewish name, iand that might be why the family's genealogical enquiries have not found a record of their marriage in the German-Lutheran church. Although there was no real persecution of Jews in Latvia at that time, Alex may have wanted to help a friend (Alexandra) to emigrate somewhere by arranging his temporary return to Latvia, for what may have been a marriage of convenience.